Letters will soon be issued to all pupils in S1/2 and in S3/4/5 about forthcoming curriculum and course choice information evenings. Pupils will be issued with the letters to take home on Thursday 21 January. Copies of both letters can also be downloaded below. 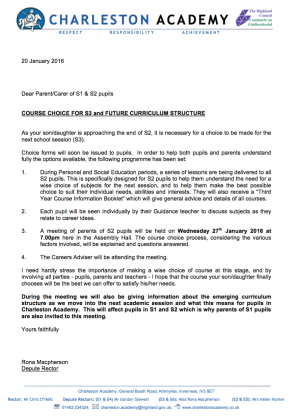 While the main purpose of the information evenings is to explain the course choice process to parents, we will also use both evenings to highlight future curriculum and timetable changes at Charleston Academy. 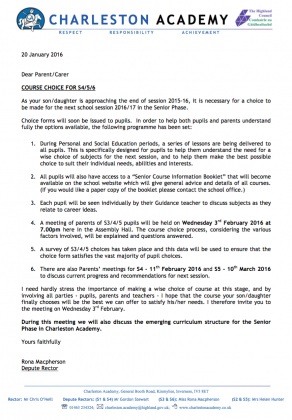 For this reason parents of S1 pupils are also invited to the meeting on 27 January. We look forward to seeing you at these meetings soon.